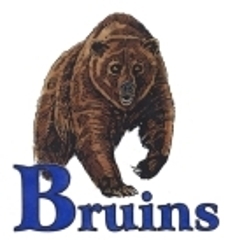 Blacksburg High School Athletics is pleased to announce that Eric Morgan will assume the role as Head Coach for the Bruin’s Baseball program. Morgan is a History and Social Studies teacher at BHS. 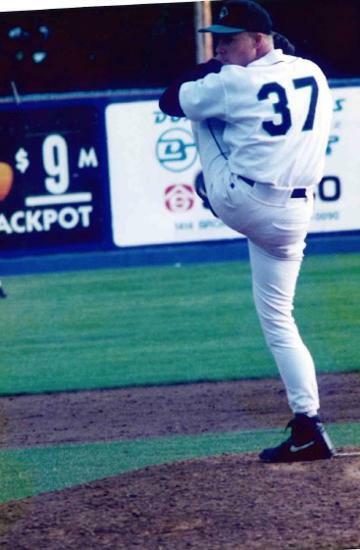 A native of Cocoa, Florida Morgan was drafted after his senior year in high school by the California Angels and as a junior in college by the Seattle Mariners where he began his professional career. While in college, he pitched in the College World Series in 1993 for Indian River CC, the National Baseball Congress (NBC) World Series 1993 Summer and the College World Series in Omaha, Nebraska in 1994 for the # 1 team in the country the Miami Hurricanes. Morgan’s athletic recognitions in include: All Conference, All-State, All Tournament, Florida State JUCO Top Pitcher, MVP East Coast of Florida, East Coast Player of the Year compiling a Pitching record of 32-8. Morgan has 15 years of experience as an assistant and head coach compiling a record of 268 wins and 93 losses. During that time, nineteen of his players were drafted by MLB teams including in the 1st, 2nd, 4th, 10th, 15th rounds. Three of those players are currently in the MLB, AJ Cole, Nick Frankiln and Todd Hankins. 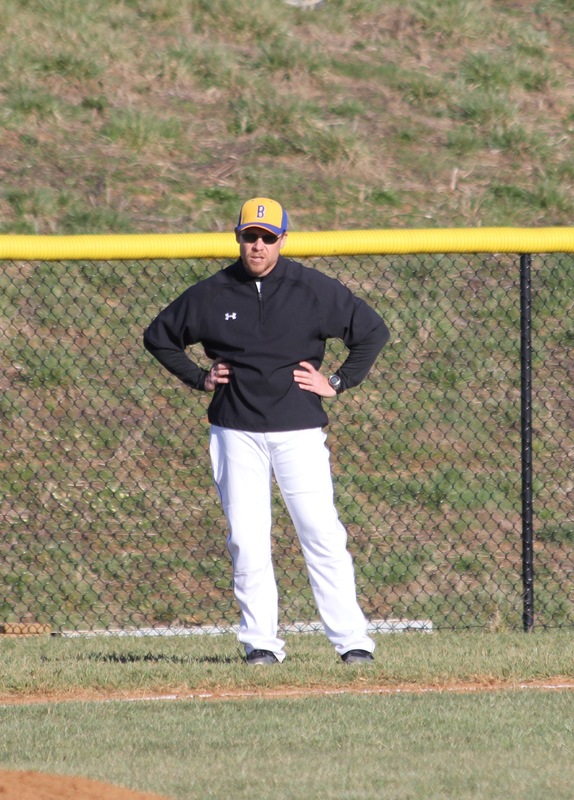 Before taking a head coaching position, he was the pitching coach at Merrit Island High in Florida where he helped the team win 2 state championships in 3 years. Morgan has also helped send over 100 student athletes on scholarship to various programs including the University of Miami, University of Central Florida, University of Georgia, Jacksonville University and Ole Miss. 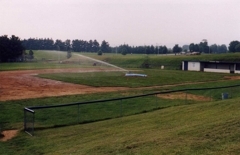 Morgan was a head coach at Oviedo High in Florida and Greenbrier East High in West Virginia where his teams competed in the State Playoffs 3 of the 6 years. During this period, he compiled a record of 80-39. During his first year at Greenbrier East his team made it to the final four for the first time in 47 years. 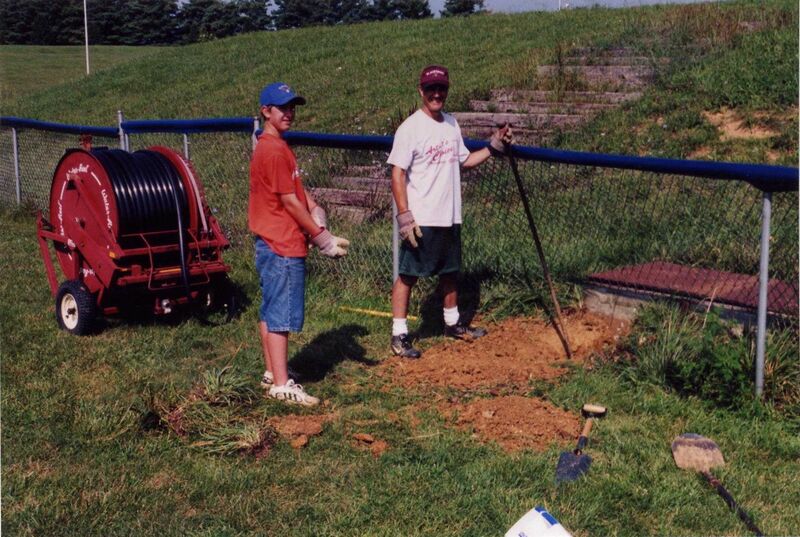 The BBA plays a major support role for the BHS Varsity & JV programs via fundraising, field maintenance, and administration of the summer wood bat league. 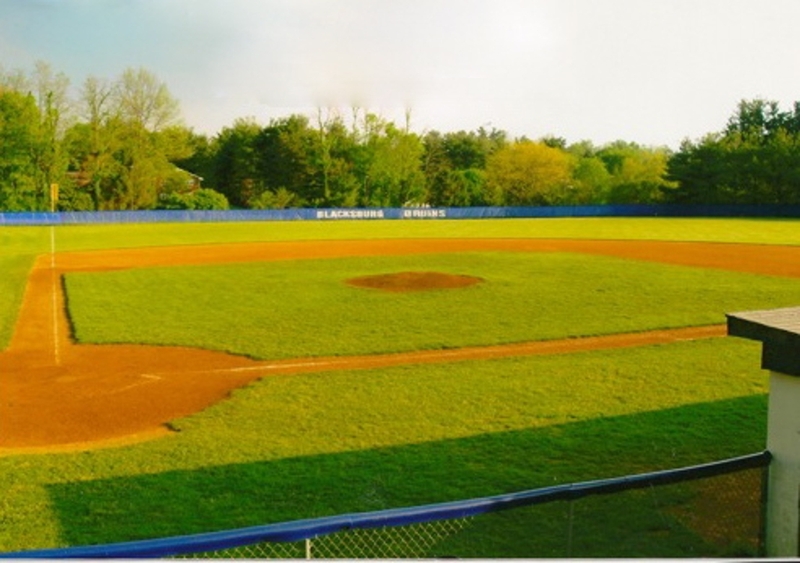 The main goal of the BBA is to provide a complete support organization from coach pitch all the way to Varsity baseball. 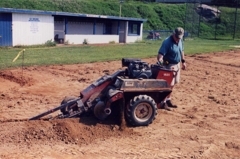 The BBA also typically handles off season field maintenance, watering, mowing, including purchasing 26 tons of infield dirt this pre-season. 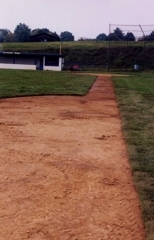 In the fall of 2006, the Blacksburg Baseball Association, in conjunction with BHS, renovated the playing surface at Blacksburg High School. 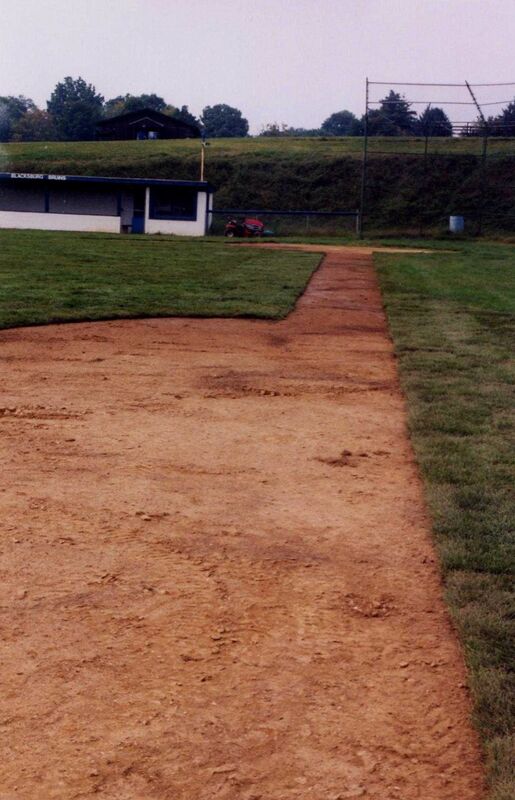 Constructed in 1974, the field has had more than its share of wear and tear. 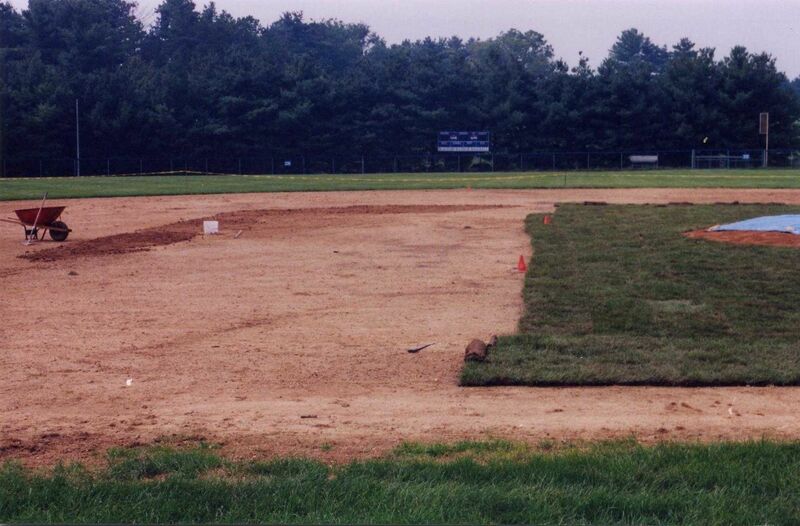 The existing infield was removed, and a comprehensive drainage system was installed. 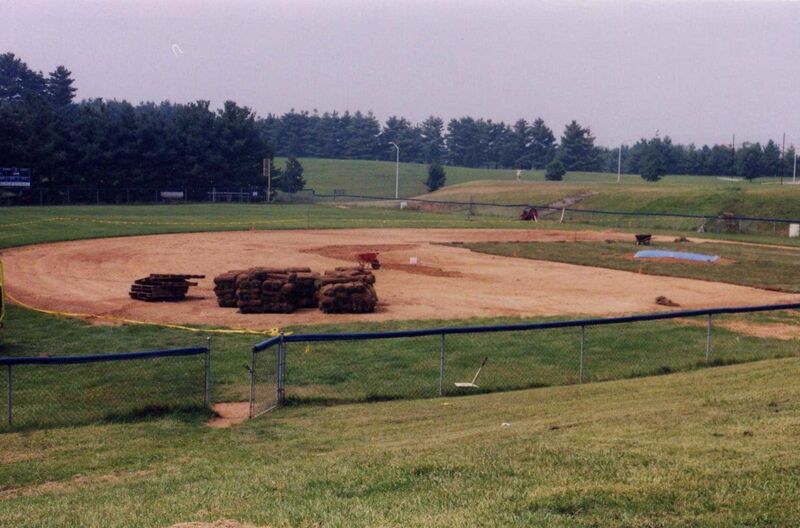 Over 100 tons of topsoil was added in order to bring the field up to specification. 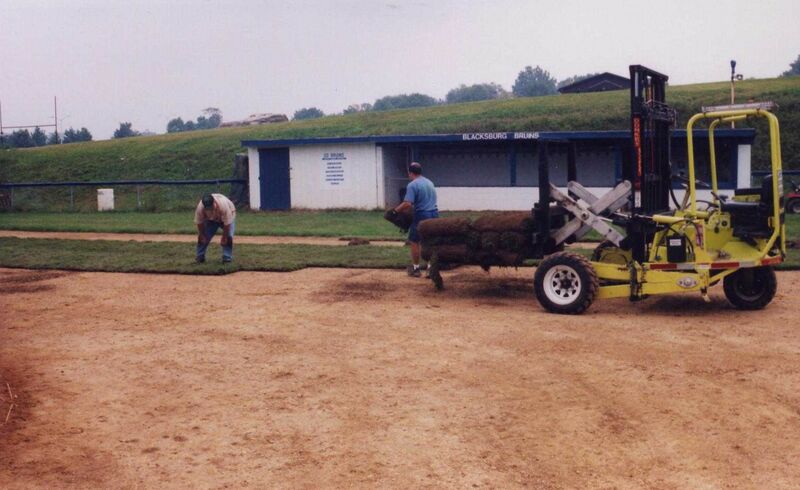 Some spots on the field were different in height by as much as 10 inches! 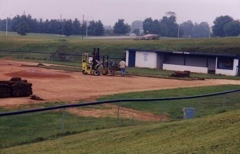 The field was graded and rocks removed. 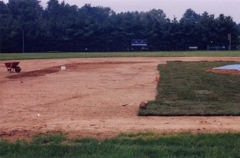 A clay pitcher's mound was installed and new sod was laid. 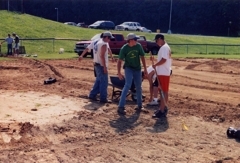 These pictures record some of the activity. The project cost was $35,000, with no cost required from BHS. 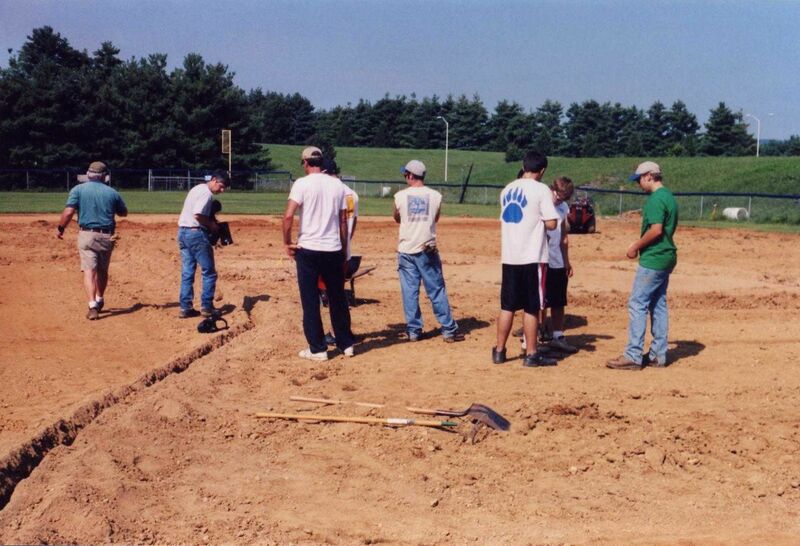 Many thanks to the countless volunteers who helped with this community project, via donations and hard labor. 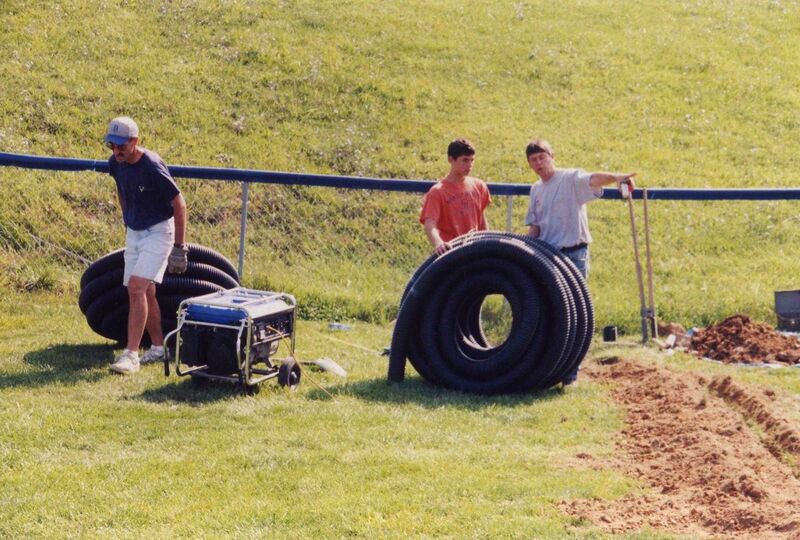 Together, we are making baseball in Blacksburg better! 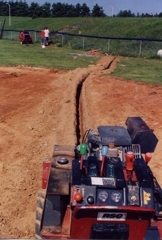 Ricky Sowers drills and saws through a concrete manhole to install the infield drain line. Tony Houff operates his ditch witch. 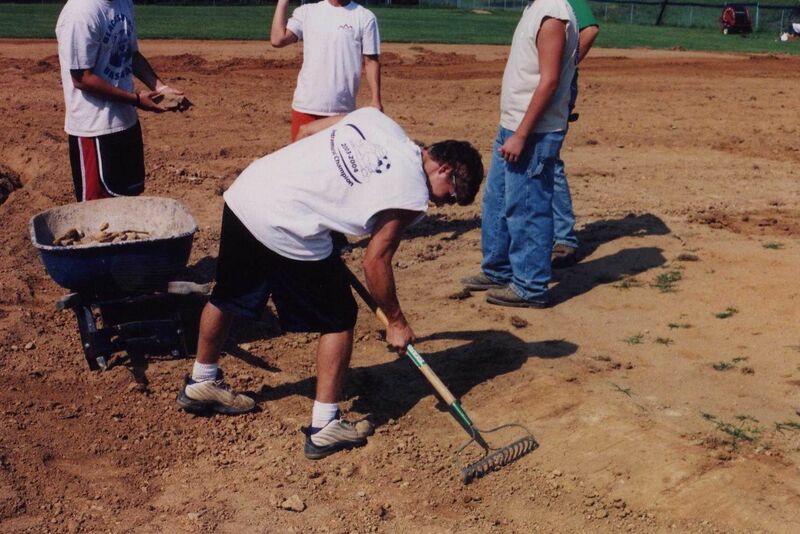 Rising Senior Greg Juanarena displays his awesome raking skills and exceptional muscular development. 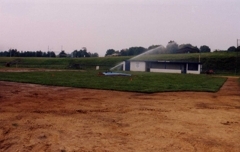 After weeks of grading, drain installation, and mound installation, the new sod was ready for installation. A different view of Ricky. 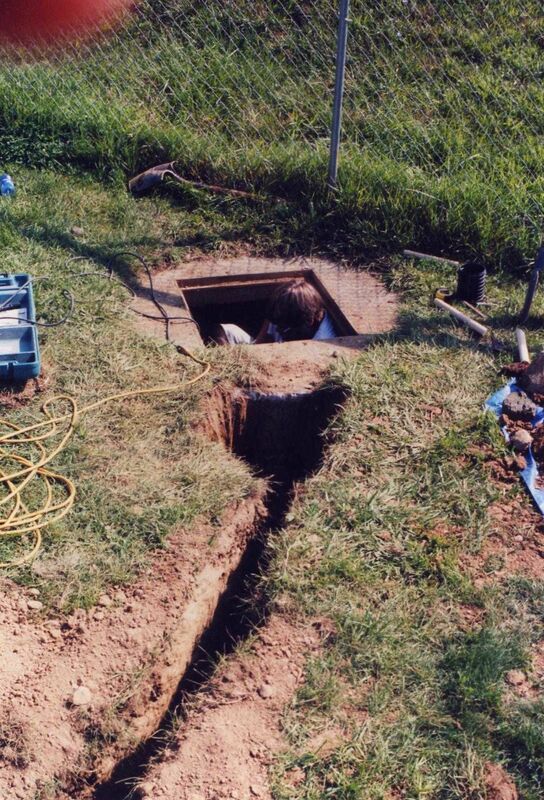 Believe it or not, it took him several hours to cut through the massive concrete structure. All 400 ft of new drain line tie into two different sewer mains. 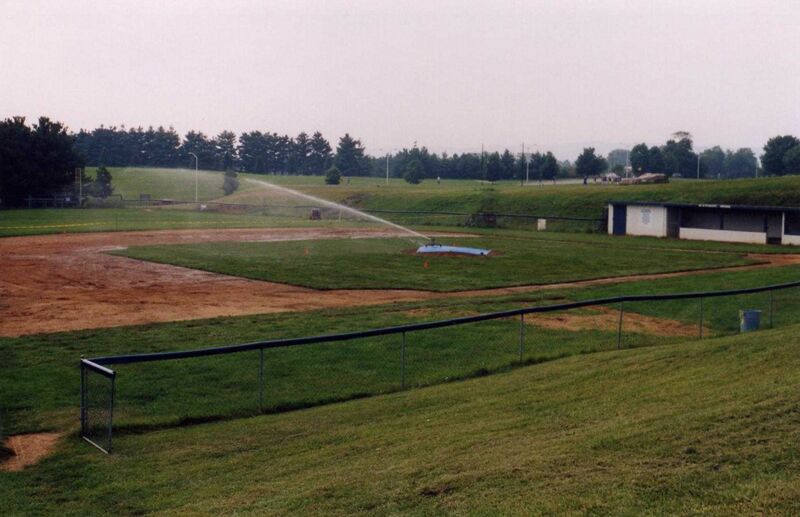 Over 400 feet of drain lines were installed to remove water from the field. John Galbraith directs players on where materials should be moved. 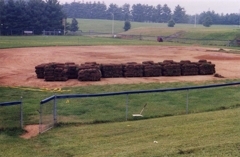 Lavery Sod Farm begins laying the new sports bluegrass. 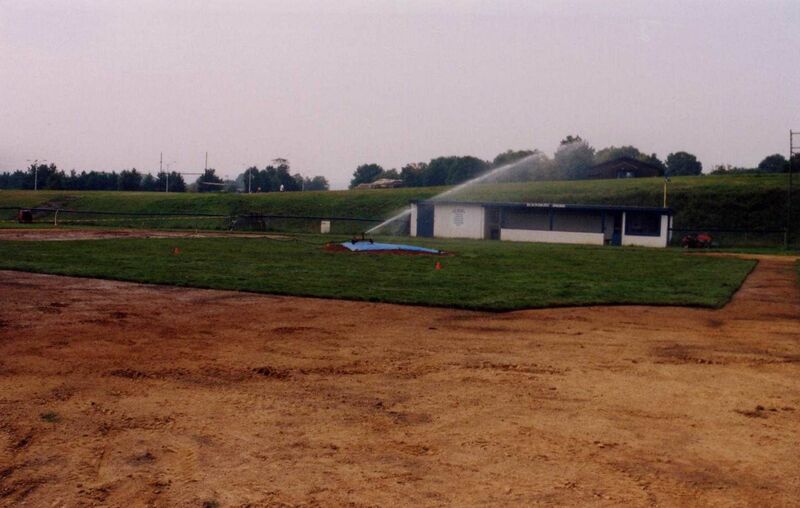 As soon as the sod was laid, it was time to water. 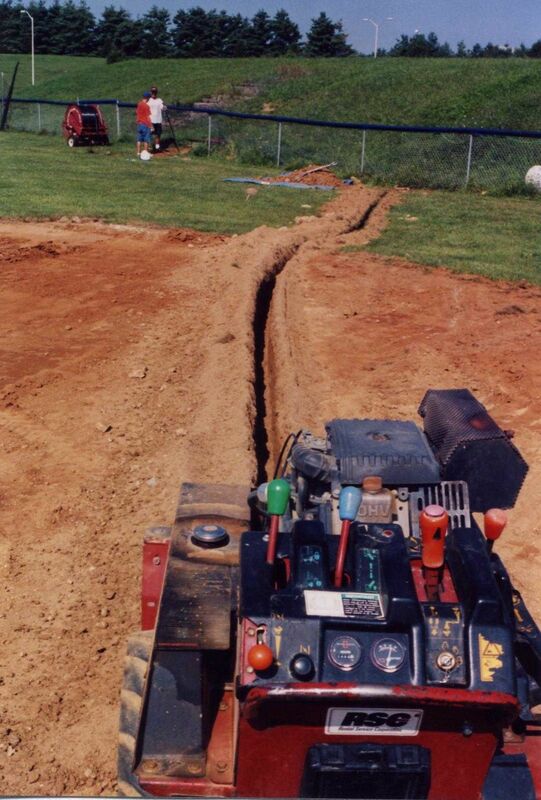 John and Michael Simonetti begin accessing the water main so the team can install the new infield water line. 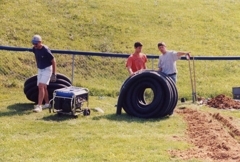 Various members of the BBA working on the field. 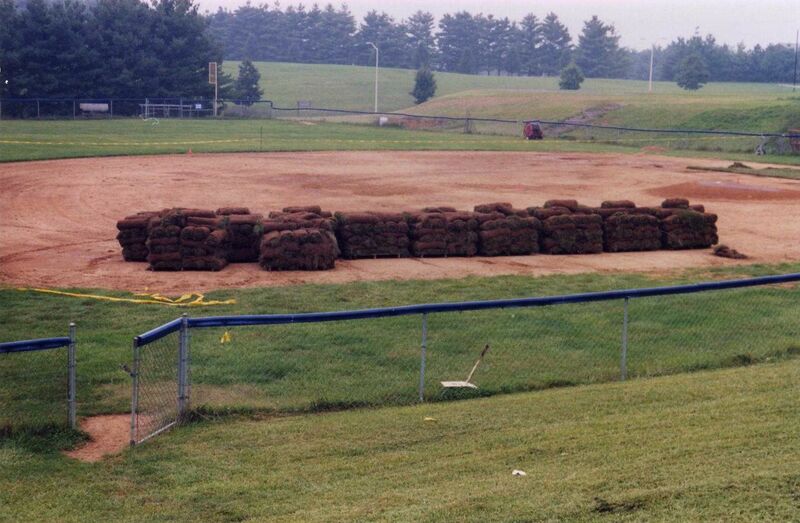 Hundreds of rocks needed to be removed before the sod could be laid.